There’s a certain quality to someone’s voice when they’re speaking about something they love, something that genuinely brings them joy and excitement. It’s a confidence in the tempo and a flow of words that spills out naturally, yet deliberately, in a lilting, velvety cadence. This quality and excitement of being is what stood out to me most about my first conversation with jewelry designer Jessica Biales. Although we hadn’t yet met when I first interviewed Jessica by phone, her warmth and sincerity made it feel as if we were already friends. It helps that we bonded over a few shared loves: jewelry of course, but also the East River Ferry, which we both agree feels like a mini vacation in the city, and my home country of Canada, where Jessica has family in Montreal. Having already fallen for her pieces, I knew from the start of our conversation that Jessica is also a woman after my own heart. What inspires me most about Jessica’s story is how she launched her brand. Jessica Biales at one of her "sanctuaries in the city," the Met Breuer museum on New York's Upper East Side. She draws constant inspiration from art, architecture and design, with some favorites including Alexander Calder, Richard Serra, Josef Albers, Louis Khan, Frank Lloyd Wright and Tadao Ando. After first falling in love with metalsmithing at Calhoun, her creative arts high school in New York, Jessica went on to study law, which she then spent ten years practicing. It was the birth of her daughter in 2007 that finally gave her the opportunity and the courage to step back from a career that had become less than fulfilling in order to pursue a more soul nourishing path, a narrative to which I’m sure many can relate. Having always kept a hand in the arts, through photography, documentary film making and jewelry design, Jessica knew the next step was to go back to that world, even if it was just for herself at the beginning. “I would make pieces with no intention of selling them, it was just something I loved to do,” she explained. But whenever we leap with conviction into something we love, the universe tends to back us up. And that’s what it did. What started as a creative pursuit soon caught the attention of Hu’s, a boutique in the Georgetown neighborhood of Washington, DC, via a piece that Jessica’s mother was wearing. And then like dominos, that led her to Celia Cohen at Autumn PR in New York and what started as a passion project became a real business. That’s not to say there wasn’t a healthy dose of hard work and the inherent challenges of running your own business along the way, but acquiring stockists including Dover Street Market, Barneys Japan, Matchesfashion.com and Colette right out of the gate is a pretty ringing endorsement from the universe that you’re on the right path. What originally attracted me to Jessica’s work, and perhaps her most recognizable pieces, are her signet rings. “Very early on, some of the first pieces I carved were different interpretations of the classic signet ring. The signet block and the oval signet have become core pieces of my collection,” she says. 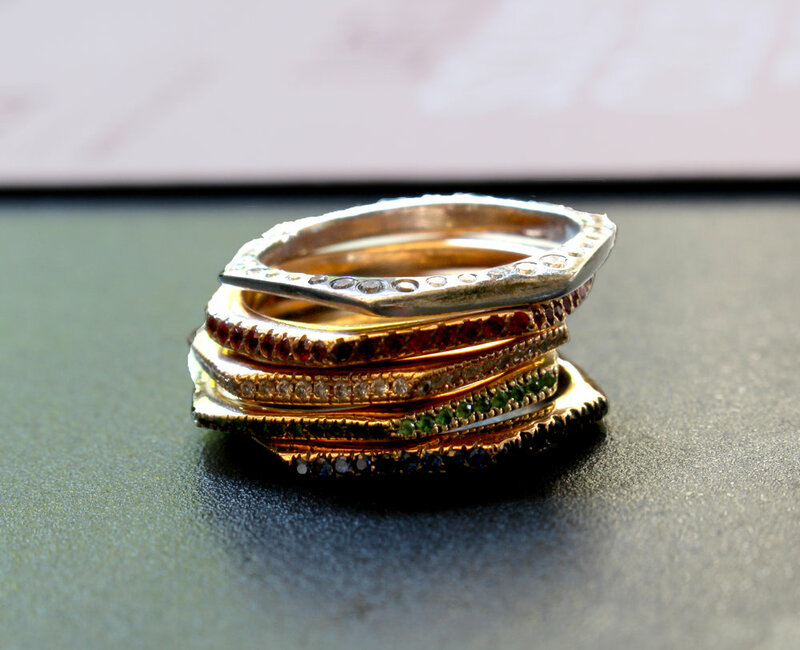 Stacks on stacks of Jessica Biales rings, including Heart and Stripe signets and bands, Honey ring, block signet and Mimosa rings. Historically, signets were conceived of as a form of signature, the mark of an authentic identity. Similarly, the signet is very much a part of Jessica’s identity as an artist. As a style, her signets make a strong statement, but in the most minimalist of ways. This mash-up of classical references and minimalist leanings has become something of a Jessica Biales calling card and she does it sooooo well. “As much as I love the classic, minimalist is one of my all-time favorite movements in terms of architecture and painting and sculpture. So, many of my pieces are meant to be very minimalist, clean looks. That’s been very much a part of my style,” she says. Jessica Biales with her Block signet, Mimosa rings and Antler ring, inspired by Matisse. And it’s a style that she has carved out for herself, literally. For her pieces that don’t require the precision necessary for a gem setting, Jessica hand carves the wax models, ultimately bringing her creations to life in gold and silver using the lost wax casting method. “I taught myself how to carve in wax and fell in love with that method because I could do it easily in my apartment, I didn’t need a torch and a workshop. So, my pieces are very sculptural and they’re not machine purposed.” she explains. Jessica Biales Slice rings, organic forms where the hand is deliberately felt. The hand, and the heart, is evident in Jessica’s signets. With the surface of a signet acting as a blank canvas, Jessica has added hearts, stripes and rainbow gems, giving these timeless pieces a truly modern touch. Inspired by her favorite go-to tee, she deftly breathed new life into that most famous of stripes, the Breton, by splashing it across her signets. In the Saxony collection, she rendered the stripes in a collegiate maroon, yellow and blue, recalling a school scarf that her father gifted her from his time in England. But the true stars of this collection are the candy signets. Featuring a perimeter of emeralds, rubies, sapphires or diamonds around the face of the signet, the rings are as addictive as their sugary namesake. It’s this combination of the strong signet shape with a bit of strategic sparkle that make Jessica’s pieces truly unique and coveted. As a piece, the signet has so much potential. In Jessica’s words, “The signet ring is my favorite piece of jewelry, it’s a time loved classic that goes with everything and never goes out of style. I love the idea of something being timeless. I plan to continue with more interpretations of the signet ring.” And frankly, I can’t wait to see what’s next. The designer at the Met Breuer. 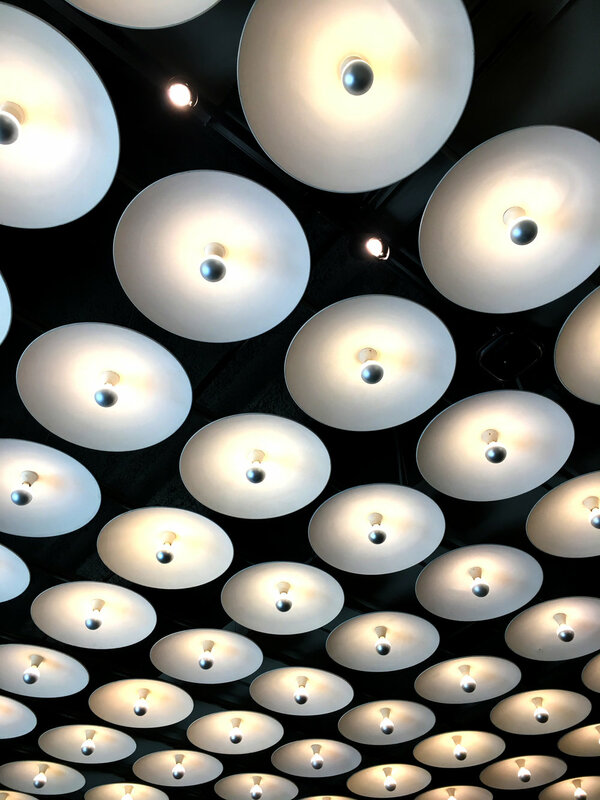 For the native New Yorker, a perfect New York City day would include a run around the reservoir in Central Park, or along the East River, then a coffee at the Met Breuer and a walk on Madison or Fifth, and then a ferry ride going to Brooklyn for dinner.